After a successful 2012 pool season, Marquee Nightclub & Dayclub at The Cosmopolitan of Las Vegas and Insomniac – the producer of music festivals such as the Electric Daisy Carnival - recently announced the return of Wet Wonderland. 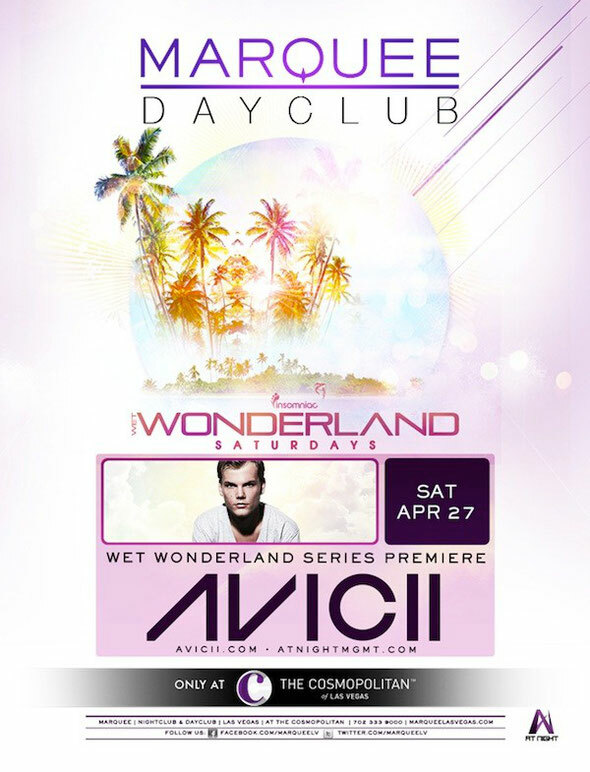 This daytime party launches April 27 with Avicii and will take place every Saturday, poolside at Marquee Dayclub. “Insomniac is a masterful event producer and their unmatched festival experience will deliver a new atmosphere to the Marquee Dayclub venue, creating an amazing daytime party each Saturday,” said Marquee Nightclub & Dayclub partner Jason Strauss. Insomniac’s track record of producing electronic dance music events combined with Marquee’s history as a host of electronic dance music artists should guarantee the event’s success. IDMA winner for Best Artist (Solo), Avicii will headline the season launch of Wet Wonderland with projects such as his major global collaboration, Avicii X You, along with his crossover album that he premiered just last month. As this year's IDMA winner for Best Artist (Solo), Avicii moves forward with his remarkable career to push the limits of what is possible within music and beyond.